Mike S. Miller, the penciller on Roaring Studio’s wonderful comic adaption of THE HEDGE KNIGHT, is also doing a series of four dramatic full-color scenes inspired by A SONG OF ICE AND FIRE. Each of them will be an original work (not a page from the comic), suitable for framing, fine art lithographs on high quality paper, limited to one thousand copies and available in three qualities. 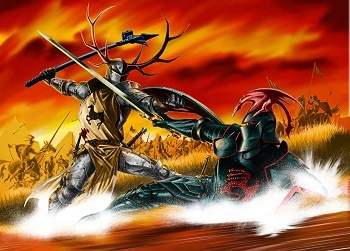 The first lithograph shows the battle between Robert Baratheon and Rhaegar, Prince of Dragonstone, in the waters of the Trident. The piece was released in February and has been selling briskly, but Mike tells me that there are still some available. If you’d to order one before they’re gone, go to the Art of Ice and Fire site at http://www.theartoficeandfire.com .